This soup is hearty, delicious, packed with nutrients and really inexpensive to make! Perfect for a winter night in with friends. Get out your trusty dutch oven(or a soup pot) and add the olive oil. Dice the onion into small pieces and put the onion in the pot on low heat. Let the onions cook for about 7 minutes. Next add the vegetable broth, spices listed above, and lentils. Like I have said before, I never measure spices when I cook, but half a teaspoon of each spice should do the trick. Taste as you go, you can always add more spice. Make sure the lentils are rinsed before you add them to the pot. Bring the broth to a simmer, reduce back to low heat and cover. Let the soup simmer covered for 25 minutes. After 25 minutes has passed, open the can of whole tomatoes, drain, cut in half and throw them into the pot. The tomatoes act like big juicy flavor sponges. I like to keep the chunks big for some texture in the soup. Now add the tomato paste and stir. This will significantly thicken the broth. Put the lid back on the pot and let the soup simmer for another 10 minutes on low heat. After 10 minutes pass, add the kale. I added the whole bunch. You can never have too many greens! Make sure to separate the leaves from the stems, as the stems are tough and chewy. I just ripped the leaves right off the stems and put them in the pot. Now put the lid back on and let simmer on low heat for another 15 minutes. After that, add a splash of fresh lemon juice. You don’t need much since the tomatoes are acidic anyway, but it helps to freshen it up. Now you’re ready to dish it out and devour! I ate mine with a piece of vegan “cheese bread”. All it is is 1 piece of Ezekiel sprouted grain bread topped with olive oil, garlic powder and vegan mozzarella. I used the follow your heart brand. Let that broil in the oven for 5-10 minutes depending on your oven. 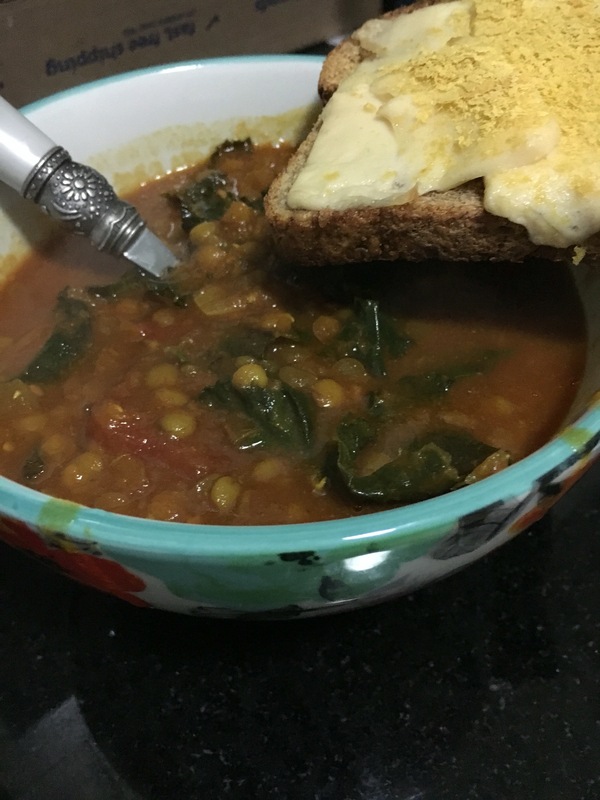 Top with some nutritional yeast, dunk that bread into the soup, and enjoy!